Nitrogen is essential for the formation of amino acids to make proteins. The nitrogen cycle describes the ways in which nitrogen is recycled. lightning – its energy causes nitrogen to react with oxygen. Plants absorb nitrates into their roots by active uptake. The nitrates are combined with glucose (from photosynthesis) to form protein. Proteins are passed through the food chain as animals eat the plants. When animals digest proteins the amino acids released can be reorganized to form different proteins. 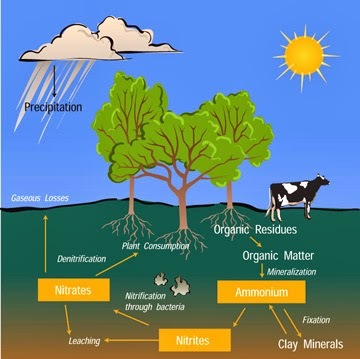 Some soil bacteria - denitrifying bacteria- break down nitrogen compounds and release nitrogen back into the atmosphere. This is a destructive process, commonly occurring in waterlogged soil. Farmers try to keep soil well drained to prevent this happening – a shortage of nitrates in the soil stunts the growth of crop plants. Nitrates and other ammonium compounds are very soluble, so they are easy leaches out of the soil and can cause pollution. growing leguminous plants, then digging the roots (with their nodules) into the soil. 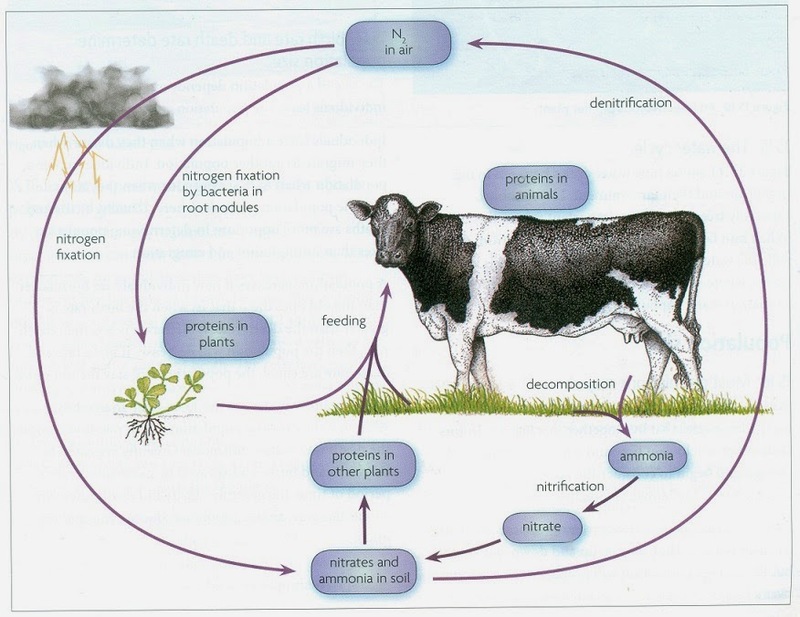 The figure below shows the nitrogen cycle. ii) Urea or ammonia or uric acid. iv) Lightning or electrical storms.